The European learning mobility scoreboards for initial vocational education and training (IVET), developed by Cedefop, and for higher education (HE), developed by EACEA/Eurydice, were launched by the European Commission on 8 December on the occasion of the first European vocational skills week. Studying and training abroad helps people build valuable skills and experience – as millions of past Erasmus students and trainees can demonstrate. The scoreboards show how well different countries are managing to create a favourable environment for mobility, and can help spur improvement. The higher education scoreboard builds on a 2013 pilot study. For IVET, the scoreboard comes at the right time of increased political attention to mobility of vocational students and apprentices. The scoreboards are presented on a common online platform. Learning abroad is generally seen as an enriching and often far-reaching experience, especially for young people. The European Union has promoted learner mobility for many years through various policies, programmes and tools, with the aim to reduce youth unemployment and to better match its workforce’s skills to labour market needs. In 2011, the Council also set the goal that, by 2020, at least 6% of all 18 to 34 year-olds with a VET background be granted a learning experience abroad. In the same year, it adopted a Recommendation encouraging Member States to promote learning mobility of young people. Through this Recommendation, Member States commit to promoting and removing obstacles to learners' mobility. In addition, the Council advocated the creation of a tool – a ‘mobility scoreboard’ – which would ‘monitor (…) progress in promoting, and removing obstacles to, learning mobility’ in Europe. EACEA/Eurydice set out to work on a mobility scoreboard for HE. In parallel, the European Commission entrusted Cedefop with the development of a mobility scoreboard for IVET. The scoreboards for IVET and HE take stock of policies and structures in place in countries to support mobility of learners. 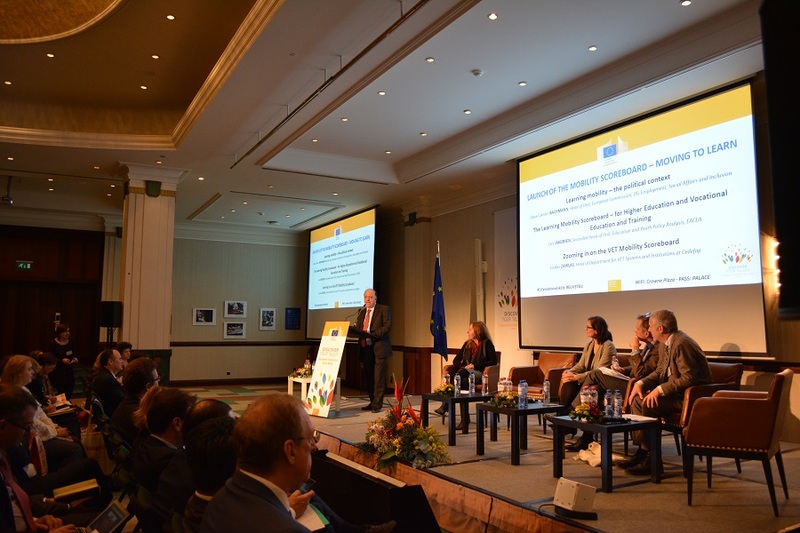 Speaking at the European business forum on VET in Brussels, where the scoreboards were launched, Cedefop’s Head of Department for VET Systems and Institutions Loukas Zahilas said that the tool is meant to assist policy-makers in IVET and to provide an overview, in a simple way, of the state of play in learner mobility. He added that it is presented in a user-friendly way with indicators, maps, country fiches and European-level reports that allow users to access a broad range of information and make comparisons. The indicators can be found in two places: on the Cedefop and the Eurydice websites, while the Cedefop website also offers more in-depth information. Dana-Carmen Bachmann, Head of Unit, DG Employment, Social Affairs & Inclusion, noted that the mobility scoreboard gives us a picture of the factors that enable a learner to access opportunities to go to another country. The scoreboard was also discussed at a workshop on mobility in VET and apprenticeships with the participation of Cedefop expert Guy Tchibozo, who is the project manager.